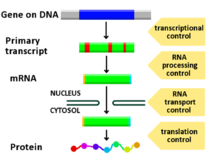 Regulation of transcription thus controls when transcription occurs and how much RNA is created. Transcription of a gene by RNA polymerase can be regulated by several mechanisms. Specificity factors alter the specificity of RNA polymerase for a given promoter or set of promoters, making it more or less likely to bind to them (i.e., sigma factors used in prokaryotic transcription). Repressors bind to the Operator, coding sequences on the DNA strand that are close to or overlapping the promoter region, impeding RNA polymerase's progress along the strand, thus impeding the expression of the gene.The image to the right demonstrates regulation by a repressor in the lac operon. General transcription factors position RNA polymerase at the start of a protein-coding sequence and then release the polymerase to transcribe the mRNA. Activators enhance the interaction between RNA polymerase and a particular promoter, encouraging the expression of the gene. Activators do this by increasing the attraction of RNA polymerase for the promoter, through interactions with subunits of the RNA polymerase or indirectly by changing the structure of the DNA. Enhancers are sites on the DNA helix that are bound by activators in order to loop the DNA bringing a specific promoter to the initiation complex. Enhancers are much more common in eukaryotes than prokaryotes, where only a few examples exist (to date).Silencers are regions of DNA sequences that, when bound by particular transcription factors, can silence expression of the gene. Chronic nicotine intake in mice alters brain cell epigenetic control of gene expression through acetylation of histones. This increases expression in the brain of the protein FosB, important in addiction. Cigarette addiction was also studied in about 16,000 humans, including never smokers, current smokers, and those who had quit smoking for up to 30 years. In blood cells, more than 18,000 CpG sites (of the roughly 450,000 analyzed CpG sites in the genome) had frequently altered methylation among current smokers. These CpG sites occurred in over 7,000 genes, or roughly a third of known human genes. The majority of the differentially methylated CpG sites returned to the level of never-smokers within five years of smoking cessation. However, 2,568 CpGs among 942 genes remained differentially methylated in former versus never smokers. Such remaining epigenetic changes can be viewed as “molecular scars” that may affect gene expression. In rodent models, drugs of abuse, including cocaine, methampheamine, alcohol and tobacco smoke products, all cause DNA damage in the brain. During repair of DNA damages some individual repair events can alter the methylation of DNA and/or the acetylations or methylations of histones at the sites of damage, and thus can contribute to leaving an epigenetic scar on chromatin. Such epigenetic scars likely contribute to the persistent epigenetic changes found in addiction. Pattern generation of the hand (digits - interdigits): the gradient of sonic hedgehog (secreted inducing factor) from the zone of polarizing activity in the limb, which creates a gradient of active Gli3, which activates Gremlin, which inhibits BMPs also secreted in the limb, results in the formation of an alternating pattern of activity as a result of this reaction-diffusion system. In general, most experiments investigating differential expression used whole cell extracts of RNA, called steady-state levels, to determine which genes changed and by how much. These are, however, not informative of where the regulation has occurred and may mask conflicting regulatory processes (see post-transcriptional regulation), but it is still the most commonly analysed (quantitative PCR and DNA microarray). Only 5% of the RNA polymerised in the nucleus exits, and not only introns, abortive products, and non-sense transcripts are degradated. Therefore, the differences in nuclear and cytoplasmic levels can be see by separating the two fractions by gentle lysis. ^ Reference, Genetics Home. "Can genes be turned on and off in cells?". Genetics Home Reference. ^ Bell JT, Pai AA, Pickrell JK, Gaffney DJ, Pique-Regi R, Degner JF, Gilad Y, Pritchard JK (2011). "DNA methylation patterns associate with genetic and gene expression variation in HapMap cell lines". Genome Biology. 12 (1): R10. doi:10.1186/gb-2011-12-1-r10. PMC 3091299. PMID 21251332. ^ Vertino PM, Spillare EA, Harris CC, Baylin SB (Apr 1993). "Altered chromosomal methylation patterns accompany oncogene-induced transformation of human bronchial epithelial cells" (PDF). Cancer Research. 53 (7): 1684–9. PMID 8453642. ^ Austin S, Dixon R (Jun 1992). "The prokaryotic enhancer binding protein NTRC has an ATPase activity which is phosphorylation and DNA dependent". The EMBO Journal. 11 (6): 2219–28. doi:10.1002/j.1460-2075.1992.tb05281.x. PMC 556689. PMID 1534752. ^ Saxonov S, Berg P, Brutlag DL (2006). "A genome-wide analysis of CpG dinucleotides in the human genome distinguishes two distinct classes of promoters". Proc. Natl. Acad. Sci. U.S.A. 103 (5): 1412–7. Bibcode:2006PNAS..103.1412S. doi:10.1073/pnas.0510310103. PMC 1345710. PMID 16432200. ^ Vogelstein B, Papadopoulos N, Velculescu VE, Zhou S, Diaz LA, Kinzler KW (2013). "Cancer genome landscapes". Science. 339 (6127): 1546–58. Bibcode:2013Sci...339.1546V. doi:10.1126/science.1235122. PMC 3749880. PMID 23539594. ^ Tessitore A, Cicciarelli G, Del Vecchio F, Gaggiano A, Verzella D, Fischietti M, Vecchiotti D, Capece D, Zazzeroni F, Alesse E (2014). "MicroRNAs in the DNA Damage/Repair Network and Cancer". Int J Genom. 2014: 1–10. doi:10.1155/2014/820248. PMC 3926391. PMID 24616890. ^ a b Nestler EJ (January 2014). "Epigenetic mechanisms of drug addiction". Neuropharmacology. 76 Pt B: 259–68. doi:10.1016/j.neuropharm.2013.04.004. PMC 3766384. PMID 23643695. ^ Joehanes R, Just AC, Marioni RE, Pilling LC, Reynolds LM, Mandaviya PR, et al. (October 2016). "Epigenetic Signatures of Cigarette Smoking". Circ Cardiovasc Genet. 9 (5): 436–447. doi:10.1161/CIRCGENETICS.116.001506. PMC 5267325. PMID 27651444. ^ Adhami N, Chen Y, Martins-Green M (October 2017). "Biomarkers of disease can be detected in mice as early as 4 weeks after initiation of exposure to third-hand smoke levels equivalent to those found in homes of smokers". Clin. Sci. 131 (19): 2409–2426. doi:10.1042/CS20171053. PMID 28912356. ^ Ogorodnikov A, Kargapolva Y, Danckwardt S (2016). "Processing and transcriptome expansion at the mRNA 3′ end in health and disease: finding the right end". Eur J Physiol. 468 (6): 993–1012. doi:10.1007/s00424-016-1828-3. PMC 4893057. PMID 27220521. ^ a b Friedman RC, Farh KK, Burge CB, Bartel DP (Jan 2009). "Most mammalian mRNAs are conserved targets of microRNAs". Genome Research. 19 (1): 92–105. doi:10.1101/gr.082701.108. PMC 2612969. PMID 18955434. ^ Lim LP, Lau NC, Garrett-Engele P, Grimson A, Schelter JM, Castle J, Bartel DP, Linsley PS, Johnson JM (Feb 2005). "Microarray analysis shows that some microRNAs downregulate large numbers of target mRNAs". Nature. 433 (7027): 769–73. Bibcode:2005Natur.433..769L. doi:10.1038/nature03315. PMID 15685193. ^ Selbach M, Schwanhäusser B, Thierfelder N, Fang Z, Khanin R, Rajewsky N (Sep 2008). "Widespread changes in protein synthesis induced by microRNAs". Nature. 455 (7209): 58–63. Bibcode:2008Natur.455...58S. doi:10.1038/nature07228. PMID 18668040. ^ Baek D, Villén J, Shin C, Camargo FD, Gygi SP, Bartel DP (Sep 2008). "The impact of microRNAs on protein output". Nature. 455 (7209): 64–71. Bibcode:2008Natur.455...64B. doi:10.1038/nature07242. PMC 2745094. PMID 18668037. ^ Palmero EI, de Campos SG, Campos M, de Souza NC, Guerreiro ID, Carvalho AL, Marques MM (Jul 2011). "Mechanisms and role of microRNA deregulation in cancer onset and progression". Genetics and Molecular Biology. 34 (3): 363–70. doi:10.1590/S1415-47572011000300001. PMC 3168173. PMID 21931505. ^ Geaghan M, Cairns MJ (Aug 2015). "MicroRNA and Posttranscriptional Dysregulation in Psychiatry". Biological Psychiatry. 78 (4): 231–9. doi:10.1016/j.biopsych.2014.12.009. PMID 25636176. ^ Barnett JA (2004). "A history of research on yeasts 7: enzymic adaptation and regulation". Yeast. 21 (9): 703–746. doi:10.1002/yea.1113. PMID 15282797. ^ Dequéant ML, Pourquié O (May 2008). "Segmental patterning of the vertebrate embryonic axis". Nat Rev Genet. 9 (5): 370–82. doi:10.1038/nrg2320. PMID 18414404. ^ Gilbert SF (2003). Developmental biology, 7th ed., Sunderland, Mass: Sinauer Associates, 65–6. ISBN 0-87893-258-5. ^ Nehlin JO, Carlberg M, Ronne H (1991). "Control of yeast GAL genes by MIG1 repressor: a transcriptional cascade in the glucose response". EMBO J. 10 (11): 3373–7. doi:10.1002/j.1460-2075.1991.tb04901.x. PMC 453065. PMID 1915298. ^ Cheadle C, Fan J, Cho-Chung YS, Werner T, Ray J, Do L, Gorospe M, Becker KG (2005). "Control of gene expression during T cell activation: alternate regulation of mRNA transcription and mRNA stability". BMC Genomics. 6: 75. doi:10.1186/1471-2164-6-75. PMC 1156890. PMID 15907206. ^ Jackson DA, Pombo A, Iborra F (Feb 2000). "The balance sheet for transcription: an analysis of nuclear RNA metabolism in mammalian cells". FASEB Journal. 14 (2): 242–54. doi:10.1096/fasebj.14.2.242. PMID 10657981. ^ Schwanekamp JA, Sartor MA, Karyala S, Halbleib D, Medvedovic M, Tomlinson CR (2006). "Genome-wide analyses show that nuclear and cytoplasmic RNA levels are differentially affected by dioxin". Biochimica et Biophysica Acta. 1759 (8–9): 388–402. doi:10.1016/j.bbaexp.2006.07.005. PMID 16962184.